Every year it's something. Some colorful construction of cloth or fluff or plastic or silicon, the big holiday toy that no actively loved child can do without. Graphic designer Abby Ryan Bennett tracks the trend for 50 years, from the Easy-Bake Oven to the Wii U. 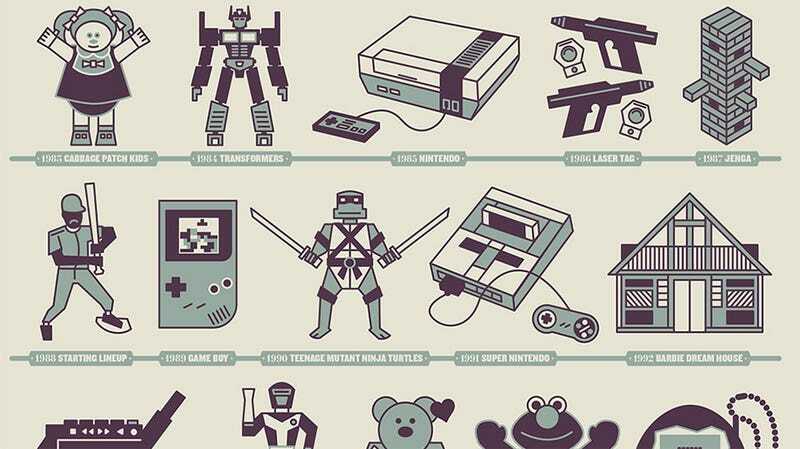 It's like a map of my life, from Star Wars figures to the latest video game consoles. It may start in 1963, ten years before I bugged my parents for anything, but residual want (child translation: desperate need) lingers in all directions. We cannot have all of these things, and that is sad. Thanks to Abby Ryan, we can at least have a pretty picture of them, all in a row, for only $15.